United States Army Air Force gunner Sgt. 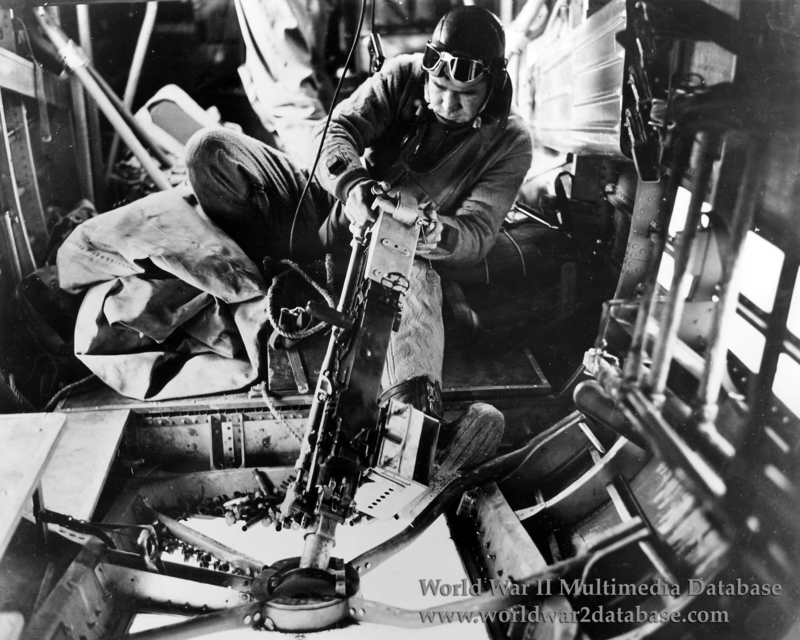 William Watts of Alexandria, Louisiana, demonstrates the tunnel-mounted Browning .50 caliber (12.7 mm) machine gun of the Consolidated B-24D/LB-30 Liberator. This photo appeared in the LB-30 Erection and Maintenance Instruction manual (TO 01-5ED-2) in 1942. This could have been a staged photo by Consolidated. It is not clear if he is engaged in combat, as he is not wearing an oxygen mask and the machine gun is not exhibiting recoil. Note spent .50 caliber casings caught in the gunner's window. The waist gunner is visible behind him. Originally introduced in the B-24C model, which did not see combat, the tunnel gun had a limited field of fire and was difficult to operate in combat. As result 287 B-24Ds were equipped with Bendix power turrets that could be retracted into the aircraft for takeoff and landings. The Bendix turret induced nausea and disorientation in the ball turret gunners, and soon the turret was deleted and replaced with the tunnel gun again. It was not until the successful Sperry turret was installed (like the one used on the B-17E/F, only it could be retracted into the fuselage) that the B-24 had a workable belly gun defense. Eventually a nose turret like the tail turret was also added, bringing the total number of .50 caliber machine guns to over thirteen. The B-24 never upgraded its engines, resulting in diminished performance since the extra turrets added significant weight. The first B-24D combat mission was on October 9, 1942 by the 93rd Bomb Group of the 8th Air Force against locomotive manufacturing in Lille, France. Out of twenty-four aircraft, one was shot down.